Here at Atlantic Electric Vehicles, we believe the future is now. We specialize in street legal golf carts, also known as LSV's (Low Speed Vehicles), and offer environmentally friendly, electric-vehicle solutions that are more than just golf carts. 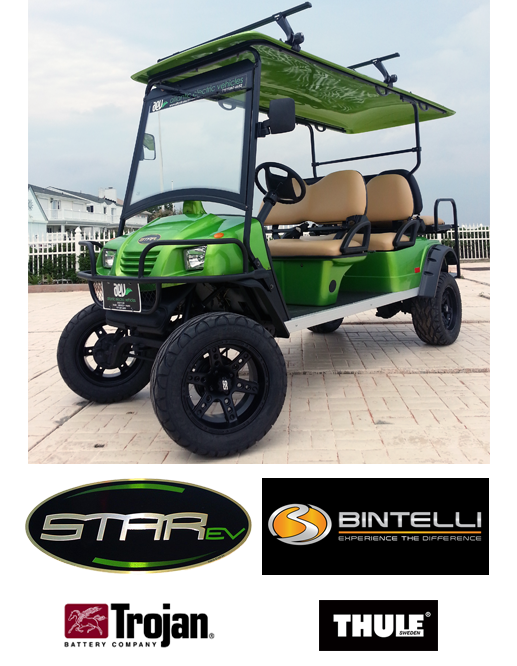 Our STAR and BINTELLI lines include street legal LSV's from 2 passenger models to 23 passenger buses, from factory lifted hunting buggies to factory lifted street legal LSV's. Our ACG line of LSV vehicles include the new model MOKE, California Roadster, '39 Roadster and the popular T-Sport LSV. We are located on Virginia Beach Blvd in the Oceana area of Virginia Beach. We deal in the Trojan brand of golf cart batteries and are also an authorized Thule surf rack dealer.